While you don't need to be fluent in boating terminology to operate a boat or enjoy boating activities, there will be times when you will wish you had at least a rudimentary knowledge. While there are hundreds of nautical terms, some dating back to the 17th century, I shall only introduce you to some of the more common terms which you will encounter today. Don't worry there is no quiz at the bottom. Some of the terms you probably already know and the rest will become yours with use. * Abeam -a point 90 degrees from an imaginary line running from the front to the back of the vessel. * Aft-Towards the back or stern of a vessel. * All-round light-a light showing an arc of 360 degrees. May be red, green or white. 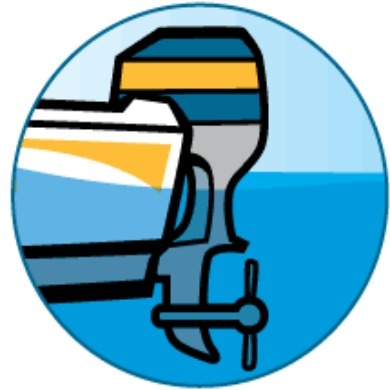 * Anchor-a device attached to the vessel by a line or chain used to prevent the vessel's movement. * Astern-towards the stern or rear of a vessel. * Bilge-the inside bottom of a vessel where water collects and must be baled or pumped out. * Bilge Pump - a pump used to pump water from the bilge. * Bow- front of the vessel. * Cleat - A horn-shaped device to which a line is secured. Commonly found on docks which allows a vessel to be secured to it. * Draft - that part of the hull below the water. * Forward - a direction toward the bow. * Freeboard - The amount of hull above the waterline. * Hawser - a large rope for used for towing or mooring a vessel. * Head - the latrine or toilet. * Hull - the physical structure of the outside part of a vessel. * Inboard - an automotive engine converted for marine use. The engine and transmission are inside the vessel and the drive shaft is extended through the hull to which a propeller is attached. * Inboard/Outboard - A marine engine with the traits of both an inboard and outboard engine. Also, known as sterndrive. * Keel - the bottom center of the hull. * Knot - a unit of speed where 1 nautical mile equal 1.8520 km or 1.1508 miles per hour. * Lee Side - the side sheltered from the wind. * Line - the nautical term for the ropes used aboard a vessel. * List - a lean or tilt to one side usually caused by flooding or cargo shift. * Magnetic Bearing - absolute bearing based on Magnetic north. * Magnetic North - the direction towards the North Magnetic Pole. * Marina - a docking and fueling facility for vessels. * Nautical Mile - a distance of 1.852 meters or 6,076 feet. * Outboard - a marine motor attached to the transom of a vessel. * Pitch - the up and down movement of the bow and stern. * Planing - when the vessel skims over the water rather than pushing through it. * Port - the left side of a vessel when facing the bow. * Prop Wash - the accelerated motion of the water caused by the propeller. * Roll - a vessel's motion along the longitudinal axis; the vessel's motion from side to side. * Sea Anchor - a canvas bag or bucket attached to a line used to slow the forward motion of the vessel or to keep it heading into the wind in rough water. 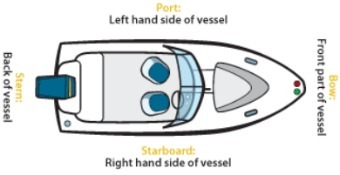 * Starboard - the right side of the vessel when facing toward the bow. * Stern - the rear part of the vessel. * Sterndrive - A marine engine with the traits of both an inboard and outboard engine. Also, known as inboard/outboard. 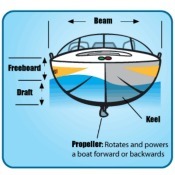 * Tilt - how the vessel rides in the water in relation to the beam; a forward tilt indicates the bow is down in the water. 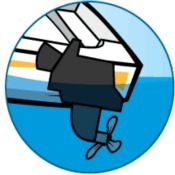 Tilt can be adjusted by lowering or raising the outboard. * Transom - the vertical surface area of the stern. An outboard motor is attached to the transom. 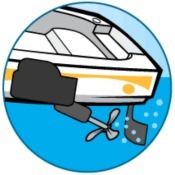 * Trim - how the vessel rides in the water in relation to the keel. * Trim Tabs - panels that are used to correct a list. * True Bearing - an absolute bearing using true north as opposed to magnetic north. * Waterline - Where a vessel rests in the water. The separation point between how much vessel rests above the water and how much is below the water. I started this website in February 2011, and, quite honestly, it has not lived up to my hopes and expectations. I would appreciate some honest appraisals and suggestions as to how to improve it. Please feel free to "tell it like it is."